This is the Solar F1 Racer Kit from the Jr. Scientist Series by ElencoElectronics. Suitable for Ages 10 & Older. FEATURES: Construct a motorized DIYproject using power from a solar cell or one AA battery (not included) Learnhow motors and automotive transmissions work Solar cell, plastic body, gears,shafts, motor, and all necessary parts included Instructions manual INCLUDES:One Solar F1 Racer Kit REQUIRES: 1 AA battery (FUGP4304) - optional COMMENTS:Due to small parts that could cause a choking hazard please keep away fromchildren 3 years of age and younger; From the Manufacturer; Build a solarpowered motorized Formula 1 race car. Power the racer from a solar cell or one"AAA" battery. Learn how motors and automotive transmissions work. Includes asolar cell, plastic body, gears, shafts, motor and all necessary parts.Requires one (1) "AAA" battery. 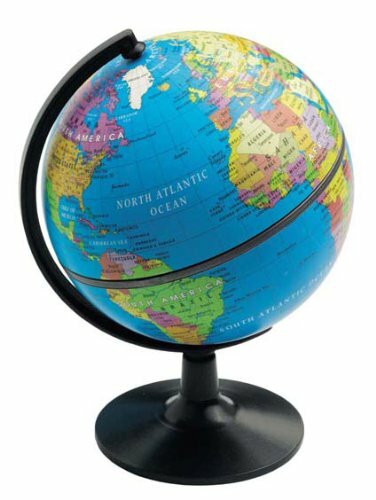 From the Manufacturer 5" Desktop Political Globe, 2 piece globe with sturdy base.